Despite the fact that the plural of leaf is leaves, Joni wasn't being illiterate here. The male character in Raised On Robbery is watching a televised hockey game in the bar and has made a friendly wager on a Canadian team called the Toronto Maple Leafs. 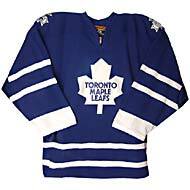 The proud Leafs name goes back to their formation in 1927 when the team owners chose "a patriotic Maple Leaf as the team namesake and crest." Because of the City of Toronto's important (and, some say, overbearing) role in the economy and culture of Canada, the Maple Leafs have been called both Canada's Team and "those #%&! *?$# Leafs." Incidentally, betting on the Leafs anytime between 1967 (when they won their last Stanley Cup) and about 1999, would probably have been a losing proposition: the only thing proud about the Leafs during that long period was their heritage, not their on-ice performance. Is Joni using an artistic license here? Chevrolet didn't even debut the Biscayne until 1958 (shown here), probably due to the success of the previous year's overall car sales. With 1,522,536 units sold in 1957, Chevy beat out Ford by 136 cars. 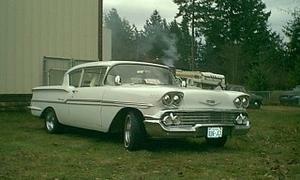 Although their eventual popularity was certainly not predicted when they were first introduced, 1957 Chevrolet vehicles have become one of the most sought after model years of all vehicles. Not to quibble with Joni's official site, but since you can hear her clearly deviate from what is here at least once (an 's' on 'best recipe'S to rhyme with groceries), and since Joni is such a consummate song crafter, I just wonder is all.